That’s how our conversation began. Her questions and statements are more than familiar to me. I have heard them or variations of them many times before. I have asked and wrestled with them myself, more than a few times. Most of us, I think, do and usually more than once. I wasn’t too quick to speak or to try to answer her questions. So I let silence do its work, to deepen her questions. There is more to what she was asking than her spoken questions. Besides, I don’t have her answers. In some sense her questions may be more important than any answer she or I might give. They point to something deep within her; a longing, a calling. I believe she was really asking some of the great questions of life. Who am I? Where am I from? Where am I going? What is my purpose? Ultimately these are questions of vocation. They are not answered primarily by what we do but, rather, by whom we are becoming. For most of us, I suspect, the vocational question is primarily asked and, unfortunately, often too quickly answered in terms of doing. What are you going to do when you grow up? What will you do when you graduate? What are you doing now that you have retired? 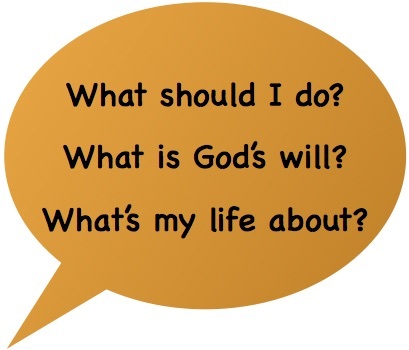 What does God want me to do? I wonder if we sometimes get so caught up in figuring out what we should do, what we think God wants us to do, that we sometimes lose sight of the vocational core that lies behind that doing. So what would this bigger view of vocation look like? Listen to what St. Basil the Great says. “The human being is an animal who has received the vocation to become God.”² How’s that for a bigger view? This vocational understanding is revealed in the incarnation of Jesus the Christ. St. Clement of Alexandria explains, “The Word of God became man so that you too may learn from a man how it is even possible for a man to become a god.”³ Our deepest and truest vocation, then, is to become, by grace, what God is by nature. That’s what the LORD told Moses when he said, “You shall be holy, for I am holy” (Lev. 11:45). Jesus echoed those words in his Sermon on the Mount, “Be perfect, therefore, as your heavenly Father is perfect” (Mt. 5:48). In this regard there is really only one vocation; to become divine, to move from having been created in the image of God to living in the likeness of God (Gen. 1:26). This one vocation, however, has many different expressions. A saying from the desert fathers makes the point here. Though we may recognize it only in retrospect “the decisions which correspond to our deepest longings proceed from a developing sense of vocation.”6 Those decisions are made in a particular time and place, and within particular contexts, relationships, and life situations. At some point those particularities will change. We age and mature. We move to a new town. We marry or divorce. New interests and passions arise. Jobs change. Children are born. Children grow up and move out. Financial resources can grow or diminish. We retire. A loved one dies. New friendships are made. Opportunities we never dreamed of come to us. Our physical or mental health changes. We have successes and accomplishments as well as failures and disappointments. We recognize new or changing needs in our communities and the world around us. These do not necessarily determine the expression of our vocation they become the raw material and context for that expression. The specifics of our lives will change but the core vocation remains. “The goal of that vocation is transformation in God, by God – our personal deification.”7 That transformation happens within and through the specifics of each of our lives. So what if, rather than seeing the divine will for our lives from a “static absolutist” viewpoint we took “an evolutionary and relational perspective?”8 What if we received, instead of grasping for, our vocation? I suspect we might discover that God is stingy and wastes nothing of our lives. We would no longer have to put ourselves in the position of reading the Divine Mind to figure out that one and only thing God wants us to do. We would be free to become the person we truly want to be and the person God knows us to already be. 1. Kathleen A. Cahalan, Introducing the Practice of Ministry (Collegeville, MN: Liturgical Press, 2010), 28. 2. Olivier Clément, The Roots of Christian Mysticism (Hyde Park, NY: City Press, 1993), 76 (citing Gregory Nazianzen, Eulogy of Basil the Great, Oration 43, 48 (PG 36, 560)). 3. Clement of Alexandria, Exhortation to the Greeks 1.8.4. 4. John Chryssavgis, In the Heart of the Desert: The Spirituality of the Desert Fathers and Mothers (Bloomington, IN: World Wisdom, Inc., 2003), 13. 6. Francis Kelly Nemeck and Marie Theresa Coombs, Called by God: A Theology of Vocation and Lifelong Commitment (Collegeville, MN: The Liturgical Press, 1992), 1. * This article was originally written for and published in Reflections, an online and print magazine of spiritual formation published by the Episcopal Diocese of West Texas. “What if we received, instead of grasping for, our vocation? Such meaningful and truly insightful post. It does echo my questions as well. Such a Good and Amazing Word, Thank You!